Why does lake ice form on the surface? Have you ever wondered why ice forms on the surface of Lake Windermere in the winter, and not at the bottom of the lake? We all know that hot air rises and cold air sinks. So why is ice and water any different? The reason why ice forms on the tops of rivers, lakes and ponds is because of the special properties of water. Recall that one molecule of water is made up of three atoms: two hydrogens, and one oxygen… H2O! This molecule has a polar charge, meaning one end is slightly positively charged while the other end is slightly negatively charged. Water, as we know it, is made up of trillions upon trillions of these tiny molecules, all interacting with each other. And these molecules are not sitting still. They are in constant motion, agitating and shifting around each other, forming and re-forming weak bonds with each other. The warmer the temperature of the water becomes, the faster these molecules agitate; the colder the water becomes, the slower these molecules agitate. When water changes temperature, it affects the speed at which the water molecules move. This changes the water’s density, because fast-moving particles can’t group together as easily as slow-moving particles. 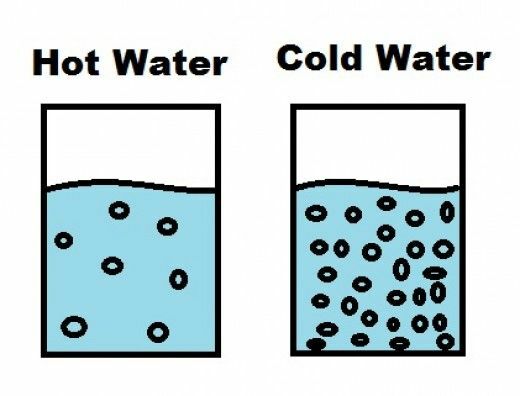 Cooling the temperature of water causes the molecules to slow down and move slightly closer together and occupy a smaller volume, which results in an increase in density (a greater # of molecules per unit area). Generally, as water cools down, it becomes “heavier”, or more dense, because of this phenomenon. This heavier, cooler water tends to sink to the bottom of a body of water, while the warmer water will float on top due to its relatively lighter density. At 4°C, water is at its highest density and the molecules are held very close together. But below this temperature, the water molecules arrange themselves in a very particular way so as to create a more favourable energy environment – this holds them more rigidly apart, and allows more air molecules to slip in between the water molecules, which means the cold water expands in volume and becomes lighter. The colder the water gets below 4°C , the less dense it becomes, until, the very cold water becomes light enough to float towards the water surface, surpassing even the warmer water molecules closest to the surface. At the surface, processes like evaporation and wind action help to cool the water even more. At approximately 0°C (depending on the atmospheric pressure at the time), water will change phase from liquid into solid, as latent heat is lost and the water molecules form rigid crystal bonds with each other. So: because of the special properties of water, water molecules arrange themselves in a very particular way in very cold water (below 4°C). This causes the very cold water to expand, reducing the number of moleclues per unit area. Because of this, ice is lighter and less dense than the water below it, and ice floats on top of the water rather than sinking to the bottom. Can you imagine what would happen to the fish and the plants in Lake Windermere if ice formed at the bottom of the lake, instead of at the surface? We definitely rely on these properties of water to be able to skate on the lake! Next time you head out on to the frozen lake, take a moment to think about the myriad of molecules that are crystallized beneath your feet!